Great Brook's machine-groomed ski trails offer all levels of cross country skiing from easiest to most difficult. The majority are rated as easiest, giving beginners plenty of options. The 10-mile network explores gently rolling terrain in the beautiful scenery of farmland, forest, streams and ponds at 1,000-acre Great Brook Farm State Park. 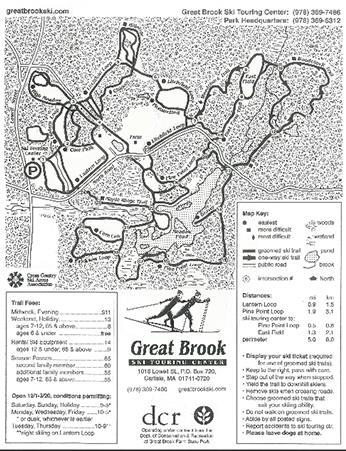 All of the groomed ski trails at Great Brook have a wide packed surface consisting of ski tracks and a skating lane. Trail names are posted at numerous intersections along with intersection numbers that are displayed on the map. Ski trails that are rated more difficult and most difficult are posted as such. Occasionally, conditions require that some trails be temporarily closed. Machine-groomed ski trails are open only to paid skiers, so please display your trail pass. Dogs are not welcome on machine-groomed ski trails. Choose designated, groomed ski trails that match your skiing ability. Walking, horseback riding, and other uses are not permitted on machine-groomed ski trails. When snow conditions do not permit groomed skiing, all trails are open to all uses. Click here to download a pdf of our trail map.